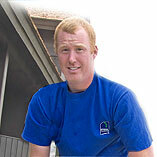 Colt, our newest employee, joined us in 2007. He’s the guy you want to have around when you’re leaning up precut 24 foot rafters or installing microlam ridges 40 feet in the air. He’s been doing a lot of framing and we can rely on him to keep it plumb, straight, and square. Everyone enjoys working with him and we look forward to his growing with us.